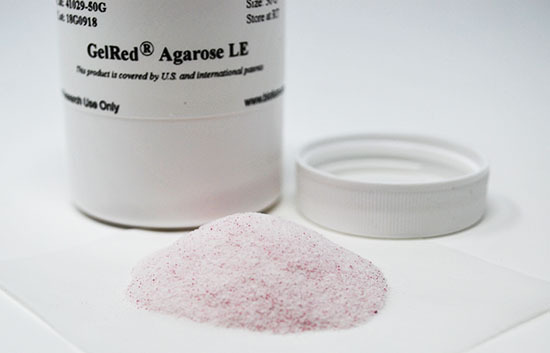 GelRed® Agarose LE is our ultra-pure molecular biology grade LE agarose pre-coated with GelRed® Nucleic Acid Gel Stain. With GelRed® Agarose, there is no need to handle concentrated fluorescent dye while preparing your gel, for greater convenience and safety. GelRed® Agarose LE has low electroendosmosis (EEO) for high electrophoretic mobility. This agarose has excellent performance for analytical or preparative nucleic acid electrophoresis and blotting. It is suitable for preparing 0.8%-2% gels in TAE or TBE buffer. In a 1% GelRed® Agarose gel, the final GelRed® concentration is 1X, just like in our standard precast protocol. GelRed® Agarose also gives excellent results at percentages between 0.8% (0.8X GelRed®) up to 2% (2X GelRed®). GelRed® and EtBr have virtually the same spectra, so you can directly replace EtBr with GelRed® without changing your existing imaging system. In addition, GelRed® is far more sensitive than EtBr. GelRed® can be used to stain dsDNA, ssDNA or RNA, however GelRed® is twice as sensitive for double-stranded than single-stranded nucleic acids. Gel staining with GelRed® is compatible with downstream applications such as sequencing and cloning. GelRed® can be removed from DNA using a gel extraction kit, or by phenol/chloroform extraction followed by ethanol precipitation. To learn more, see the GelRed® technology page, or GelRed® FAQs (below). GelRed® was subjected to a series of tests at Biotium and by three independent testing services to assess the dye’s safety for routine handling and disposal. Test results confirm that the dye is impenetrable to both latex gloves and cell membranes. The dye is non-cytotoxic and non-mutagenic at concentrations well above the working concentrations used in gel staining. Using GelRed® Agarose further minimizes risk by avoiding the need to handle concentrated dye solution. GelRed® successfully passed environmental safety tests in compliance with CCR Title 22 Hazardous Waste Characterization, under which GelRed® is classified as non-hazardous waste. See the GelRed® and GelGreen® Safety Report. 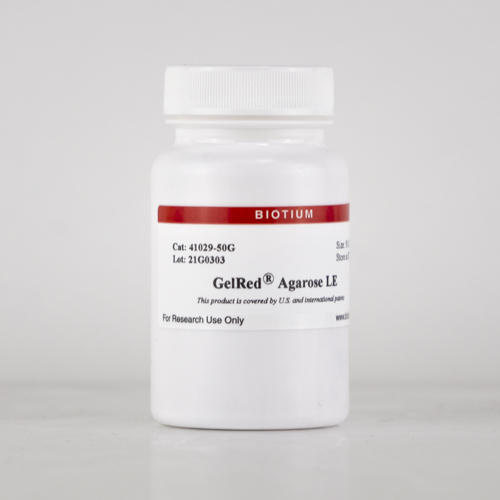 We also offer GelGreen® Agarose LE and unlabeled Agarose LE, Ultrapure Molecular Biology Grade. 5X TBE (Tris-Borate-EDTA) is a concentrated buffer solution in deionized water. TBE is used for polyacrylamide and agarose gel electrophoresis.